Portfolio Day will give students the opportunity to meet with college representatives from the most prestigious schools in our nation and to have their portfolios reviewed by these same schools. Students should bring 15 – 20 examples of original, recent art work. This event is centrally located in Poughkeepsie, New York, half way between New York City and Albany overlooking the Hudson River. Student reviews will be from 4:00 pm — 8:00 pm, and admission is FREE for all high school students, teachers, and parents. We launch our Fall Open Houses this Saturday and I am pleased to share some information about the events with you. During each undergraduate, prospective students and their families have the opportunity to experience departmental presentations, meet current SVA students, tour our campus and meet with our Financial Aid and Student Affairs staff. Learn more and view a sample schedule at sva.edu/openhouse. We look forward to our annual event in which students from grades 10-12 have the opportunity to find out about programs and receive input on their work from prestigious local and national institutions. 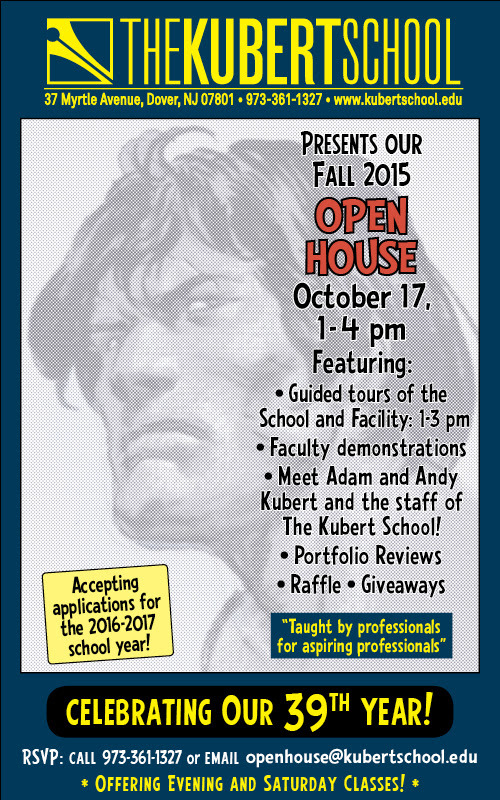 The Kubert School offers students a high quality and challenging education in Cartooning and Graphic Art. We are committed to investing our time in preparing our students for the rewarding and exciting careers and opportunities ahead of them. Congratulations to all who participated in the portfolio review day with art college reps from the New York area and the Northeast region. Students received great feedback from the college reps. The reps all commented on how impressed they were with the work being produced and the quality of the arts program in Clarkstown! Next Wednesday the following schools will have tables set up in the Art Hallway of the x-wing during periods 7,8 and afterschool until 3pm. Stop by to get information, ask questions or have your portfolio reviewed by a college rep. Feel free to speak with you art teachers about how to prepare your portfolio.